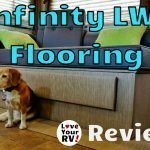 Another minor repair in my 2017 Summer RV Repair series has to do with our RVs roof. A little while ago I noticed a few bumps starting to show up here and there under the EPDM rubber roofing material. There are a half dozen smallish bumps on the slide out rooms roof and a large one in the middle of the main roof area. 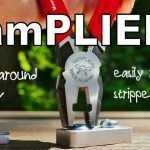 From what I gather after a bit of researching, they are staples that have worked their way free. Seems when the roofing boards are laid down, they are screwed down on the edges but stapled in the middle. Over time with the flexing of the roof panels from travel and walking on them, plus expansion and contraction due to humidity, they can sometimes pop up. The preferred way to fix the issue is to remove the roofs outside trim and fold back the rubber material. Then either replace with new staples or screws. Unfortunately, due to the location of my popped staples, this would be quite the involved endeavor. I decided to use a different method. First I did my regular roof cleaning using some Dawn dish soap and a long handled soft bristled brush. Next, I took a rag and cleaned all around the popped staple with some acetone. I cut a small slit over the popped roofing staple and pull it free. 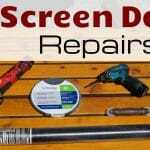 Then I replace it with a stainless steel wood screw dipped in Dicor lap sealant. To complete the repair I covered the stainless screw with a square piece of Eterabond roof tape trimmed on the edges with more Dicor sealant. I believe this patch will likely outlast the original EDPM roof material. I decided to leave the staple bumps on the slide out roof for now and just keep close tabs on them. If they grow to be a bigger problem, I’ll do the same for them. 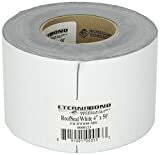 With my first use of Eternabond tape now approaching the 3-year mark, I thought it might be a good time to do a review. 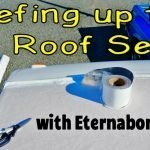 I first used Eternabond to seal the seams of a new Fantastic Fan roof vent I installed. 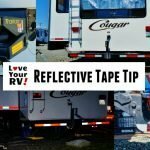 I liked it better than the regular Dicor Lap Sealant employed by the OEM and almost all RV service centers. So, I went ahead and redid all my roof vents. 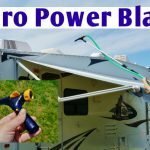 I also added Eternabond tape to the front and back seams, slide out and along the sides of the RV roofline. It may seem overboard, but I feel it’s worth it to prevent a leak. The tape also offers extra protection to the underlying rubber roof from things like tree branches. Another handy use for the tape is to hold wires in place on the roof, such as from the solar panels or WiFi/cell antennas. 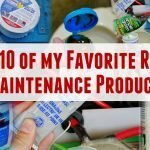 I find it a great alternative to screwing in cable ties or attaching conduit. The wires lie flat reducing the tripping hazard. Difficult to remove – The tape is bloody sticky! That’s a good thing but a bad thing if you ever need to remove it. (Here are the official Eternabond Removal Instructions) For most things, I’d go the route of just taping over the old. For instance, I recently changed my cell booster antenna where I had utilized Eternabond for running the wire across the roof. Rather than remove the old tape, I instead cut it, removed the wire and taped over with a fresh piece. I’d do the same if I needed for some reason to change a vent or skylight. Greater Upfront Cost – Eternabond tape rolls and Eternaprime spray primer are a lot more expensive than a couple tubes of Dicor Lap Sealant. 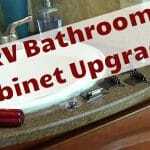 However, over time it pays off with fewer maintenance costs. I no longer need to apply new lap sealant every year as the old stuff dries up and cracks. 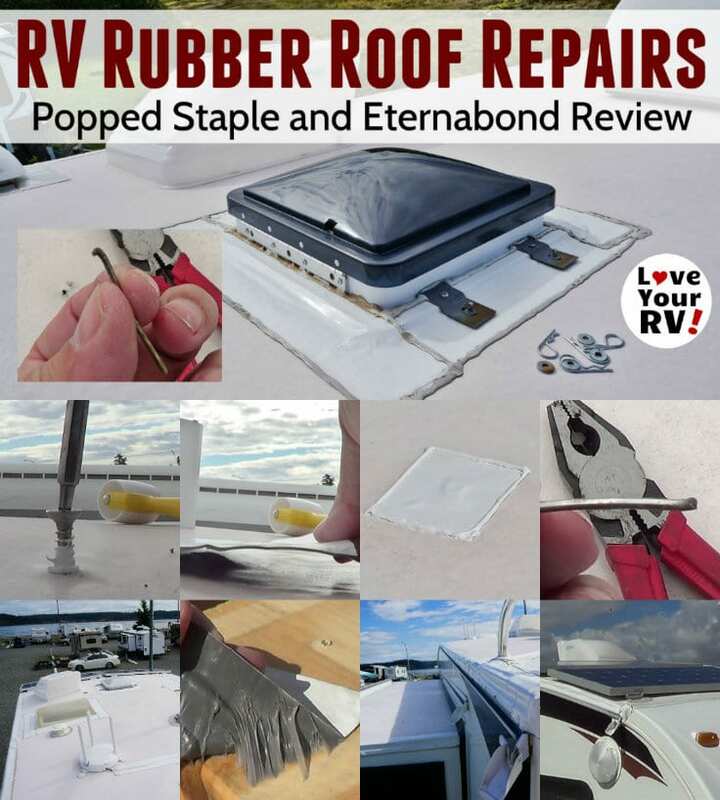 May Void Roof Warranty – I waited till my OEM warranty had ended before I started using Eternabond. If something had gone wrong with the roof, they might have latched on to the tape as a problem, even if it wasn’t. Also, the original sealants were all in good shape then. Once the rig was over two years old though, and the sealant was breaking down I became more concerned about leak prevention and less about whatever warranty may be left. 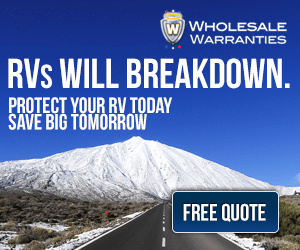 Resale Problems – When trying to sell the RV some prospective buyers may not like the tape. In my mind, though they’ll like evidence of water leaks or damage way worse. It Looks Ugly – I’ve heard this a few times as a negative. So I asked my wife about what she thinks. Answer: “I never see it, so why would I care,” haha. Truth is being on the roof no one sees it except me. Furthermore, the traditional globs and blobs of lap sealant aren’t so beautiful either and way harder to keep clean. Overall I’m happy with my decision to use Eternabond tape on the roof seams. I foresee the tape lasting as long as the EDPM rubber roof itself. At that time a whole new roof will be in order.